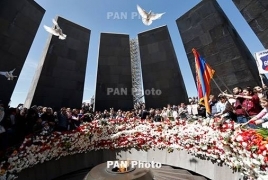 PanARMENIAN.Net - Professor Harutyun Marutyan has been elected as the new Director of the Armenian Genocide Museum-Institute, AGMI's acting director Hayk Demoyan said in a Facebook post on Friday, September 14. Demoyan was also running for the post. Demoyan first became the director of the AGMI in 2006, then took a hiatus to pursue academic career in the United States. He came back recently and was involved in a public dispute with Minister of Education and Science Arayik Harutyunyan.